The HOUTTUIN™ and WARREN® two-screw pumps are rotary‚ self-priming positive displacement pumps. In both cases‚ the basic pump design is double ended or double suction to achieve higher flow rates. The two pumps' shafts are supported between bearings. The fluid entering the suction port is split into two equal portions‚ with half being diverted to the inlet area of each opposing screw set. 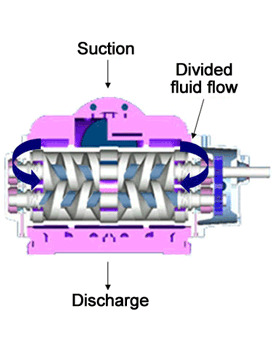 As the rotating screws intermesh‚ transfer chambers are formed‚ trapping and conveying the fluid axially to the discharge location‚ which is typically located at the mid span of the pump casing. The drive relationship between the two pump shafts is achieved through a set of timing gears. These mechanical components provide the drive transmission link between the longer shaft‚ which is connected to the input driver‚ and the shorter driven shaft. By means of this design arrangement a close clearance can be maintained between the four pumping rotors and the pump casing without the possibility of metal-to-metal contact during operation. To permit the handling of contaminated‚ corrosive process fluids and dry running‚ the bearings and timing gears are located outside of the process envelope and are independently lubricated.